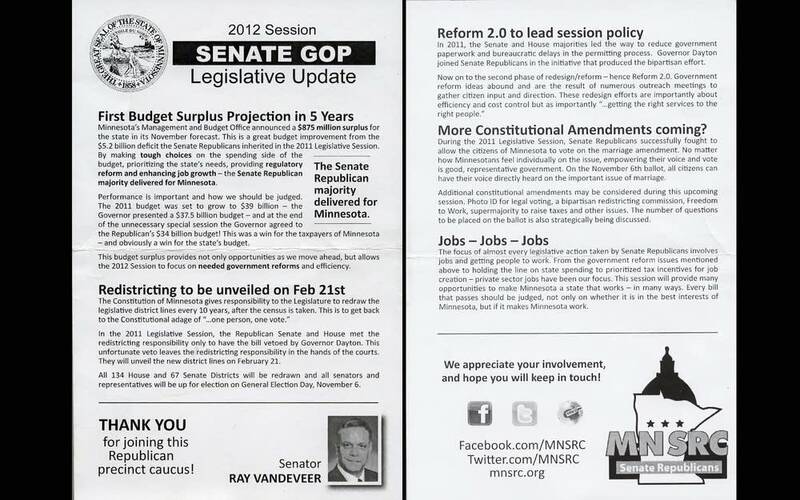 Some Republican state senators handed out pamphlets at precinct caucuses last week that were printed at taxpayer expense. Democrats allege that violates Senate rules and state law that prohibit using taxpayer money to campaign for office. But Republicans say they don't think they've done anything wrong. Among the 15 Republican senators who distributed the literature were powerful office holders like Senate Majority Leader Dave Senjem of Rochester and freshmen in swing districts, like Ben Kruse of Brooklyn Park. The brochure, titled "Senate GOP Legislative Update," credited Senate Republicans for accomplishments such as making tough choices that resulted in a projected budget surplus to giving Minnesotans a chance to vote on the proposed marriage amendment to the state constitution. "In my mind that was a constituent piece and they are constituents," Senjem said. He said the materials were handed out specifically at precinct caucuses and included a message thanking people for joining the Republican precinct caucus. Senjem said his chief attorney said it was OK to distribute the materials at caucuses. "As I read it, it was generally what are we doing as Republican members up here," Senjem said. "We passed it off to Senate counsel in terms of appropriateness. It met his test." In all, 4,725 flyers were printed at a cost of less than $50 to taxpayers. Whatever the cost, Senate Minority Leader Tom Bakk, DFL-Cook, said he has deep concerns about what happened. "I think it's absolutely outrageous that they would use state resources, state equipment, state employees and state paper to print what is clearly campaign literature," he said. Bakk said both state law and Senate policies forbid public officials from relying on state employees and equipment for political purposes. He said the materials were directly aimed at giving Republicans an advantage in the upcoming elections. By distributing the materials, Bakk said, the incumbent senators also improperly used the power of their office. He said that has the potential to hurt other Republicans as well as Democrats. "If I was going to challenge one of them for the endorsement or in the primary, how do you challenge an incumbent who has at their disposal the resources of the state Senate?" Bakk asked. "It gives them a tremendous competitive advantage against any challenge in the party." Bakk said all of his members relied on their campaign accounts to pay for printing caucus materials. Some of those costs were more than 10 times what it cost the GOP to print their materials using Senate resources. Republicans should acknowledge the mistake and pay the state back for the costs associated with the making of the materials, said Bakk, who plans to the Ramsey County Attorney to file a complaint against Senate Republicans. But former Ramsey County Attorney Susan Gaertner said that may be a tough test. She said there's no clear, bright legal line on this issue. "When prosecutors and law enforcement officials need to take a look at these kinds of cases, they need some pretty clear violations, and I haven't seen anything in these materials that would cross the line in my mind," she said.